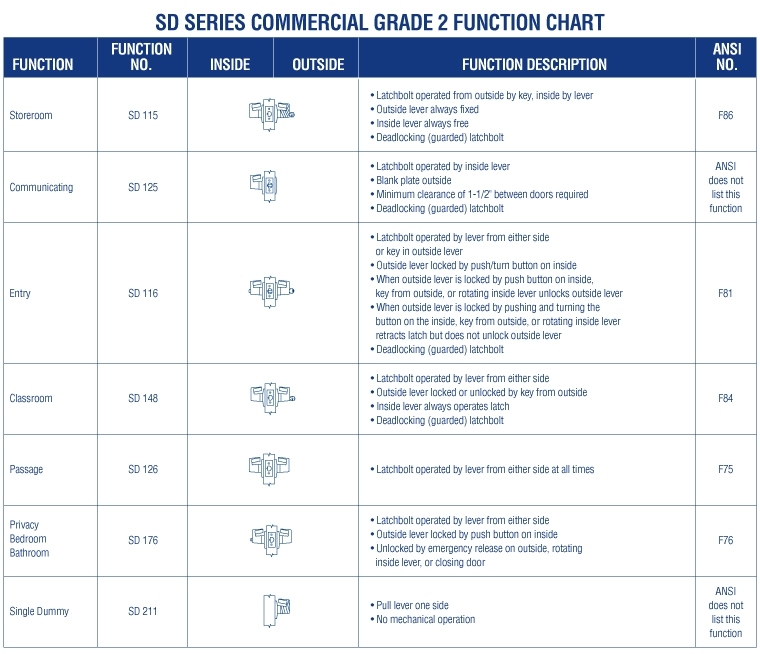 Buy the PDQ SD Series Grade 2 Cylindrical Lock from Locksandsafes.com at affordable prices. The lock comes in different functions, such as Communicating, Passage, Bathroom/Bedroom Privacy, Storeroom, Entrance or Classroom. Choose the lock model that best meets your requirements. Choose from different elegantly designed levers, which enhances the aesthetic appeal of the lock. Choose from Philadelphia type lever, Boston type lever, Miami type lever, Memphis type lever or Orlando type lever. Also choose from three top quality finishes, including Bright Brass, Oil Rubbed Bronze and Satin Chrome. The PDQ SD Series Cylindrical Lock is available in a Standard Cylinder or an Interchangeable Core Format. Please remember that the Interchangeable Core format is not available with Memphis type lever. These cylindrical locks are ANSI/BHMA Grade 2 certified and UL listed for 3 hours. They also comply with requirements of Americans with Disabilities Act and meet requirements of Buy American Act. Select the keying alike option, in case you are purchasing more than one SD series cylindrical lock and want all the locks to be keyed alike. Compatible with Best, Falcon & Arrow. Not available with Memphis lever.